I guess it's about time I got used to running in cold weather again, but I was sure glad the wind had died down when I woke up early this morning. It was bad enough on Friday with the temperatures in the low 40's facing the wind but with it only about 25 this morning, the calm was welcome. As you know I don't run many 5k's anymore but I do enjoy testing myself every now and then. 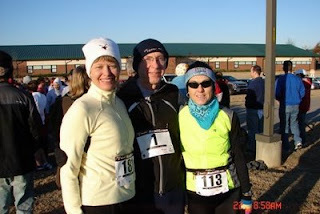 The only reason I chose this one is because my friend Maureen was the race director for this first time event and it was held in the neighborhood where she and her husband Todd live as well as my other friends Bill and Margherita Scott, The race is a fundraiser for the school PTA. A lot better way to raise money than having the kids sell over-priced junk to their friends and family I think and also a way to encourage participation by the children and their parents. I arrived just 30 minutes before the start and was happy to see the school was open with packet pick-up inside where I found Margo and the Werners. Frank just had thyroid surgery this week so he would not be running but Karla was going to give it a shot too. I quickly got my number and then went back out to do a warm-up. I finished my routine with just about 3 minutes to go and took my place near the front. there were 196 entrants but many were kids and casual runners there to support the school and I wanted to get out quickly. I got off too a good start, not too fast and settled into a good pace. Since I don't race at these quicker paces too often I 'm not quite as good as judging my pace but when I passed the first mile in 6:52, I was feeling good because I was hoping for about 7:00. The course was a bit hilly but with the low point being at the turn-around I knew that the second half would be predominately uphill. As we ran downhill to the turn, I was trying to gain as much time as I could without crossing over the redline. I made the turn and then dug in for the climb. It's funny but apparently power walking up the mountains in an ultra don't do much for preparing you to run fast uphill in a 5 k. I slowed considerably and was moaning and gasping my way to the top. I recovered quickly but I also knew I would not be running uder 7mp anymore today. I hit 2 miles in 14:41, a 7:49 mile. I hoped to maintain that pace at least but another hill with half mile to go and I was slowing even more. My legs have at least gotten better to the point that I can usually run pain-free now but I was feeling the left hamstring the last half-mile. It didn't affect my pace or form so I kept pushing and finished in 23:28. 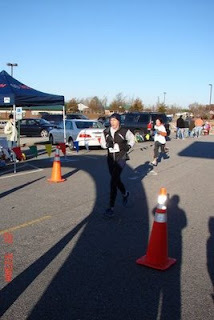 That was good enough for 2nd in my age-group but then there were only two of us in my age-group. 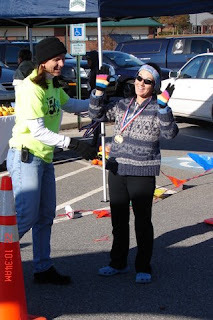 Margo would take 1st in her age-group ( thats her getting her medal from Maureen) and Karla would take 3rd in hers so we all brought home some hardware today. Maureen and her volunteers did a great job putting on a first class event.